"I need you to survive the night." Annapurna has unveiled the first official trailer for the newest film from Kathryn Bigelow, titled simply Detroit, profiling the story of the infamous Detroit riot of 1967. The film features an ensemble cast of characters to tell the story of why so many citizens decided to rise up, and how the riot expanded so quickly to become so massive that the President had to send in federal troops to get things under control. The huge cast includes John Boyega, Jack Reynor, Will Poulter, Ben O'Toole, Hannah Murray, Anthony Mackie, Jacob Latimore, Algee Smith, Joseph David-Jones, Kaitlyn Dever, Jason Mitchell, John Krasinski, Jeremy Strong, and Laz Alonso. This looks like an intense, riveting, honest portrayal of what happened back then and I'm certainly looking forward to watching this. A police raid in Detroit in 1967 results in one of the largest citizen uprisings in the United States' history. Telling the true story of the infamous Detroit riot that took place in July of 1967, which lasted five days. 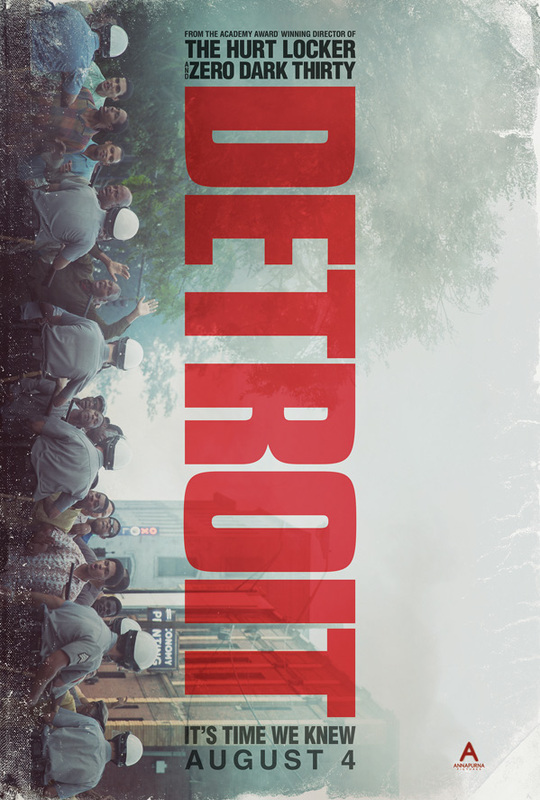 Detroit is directed by Oscar-winning American filmmaker Kathryn Bigelow, of the films Near Dark, Blue Steel, Point Break, Strange Days, The Weight of Water, K-19: The Widowmaker, Mission Zero, The Hurt Locker, Zero Dark Thirty, and the short film Last Days previously. The screenplay is written by Mark Boal, who has worked with Bigelow previously on scripts for The Hurt Locker and Zero Dark Thirty. Annapurna will release Detroit in theaters everywhere starting August 4th later this summer. Your first impression?